64 Oswego trains. One cent stamp and postmark: Oswego Oregon Nov 18 PM 1909. [addressed to and message]: Joe Lavine Woodburn Ore. Dear Joe am at Dellas raining awful cant go out could not find Brown he has moved from where he was. Dell thinks he has left town. I will come home as soon as I can get around but you cant get around town now for the rain. Yours in haste Ella. 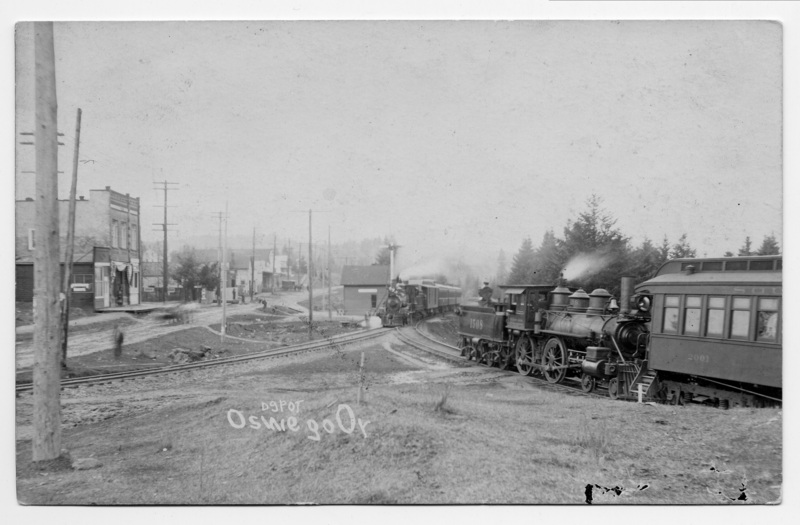 Transcription 64 Oswego trains. One cent stamp and postmark: Oswego Oregon Nov 18 PM 1909. [addressed to and message]: Joe Lavine Woodburn Ore. Dear Joe am at Dellas raining awful cant go out could not find Brown he has moved from where he was. Dell thinks he has left town. I will come home as soon as I can get around but you cant get around town now for the rain. Yours in haste Ella.